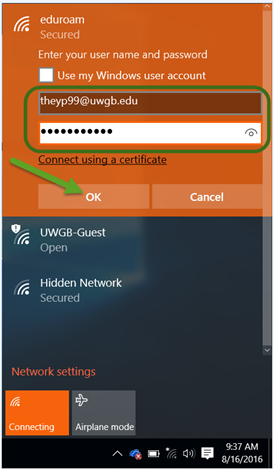 Follow these steps to connect a Windows 10 computer to the "eduroam" authenticated wireless network. Click on the wireless icon found in the lower right corner of the screen. You will see the available networks listed. Students, faculty, and staff should use the "eduroam" network. 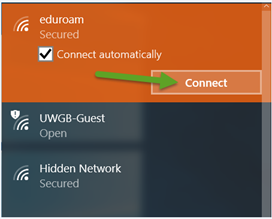 Anyone without an ".edu" account should use the UWGB Guest wireless network. 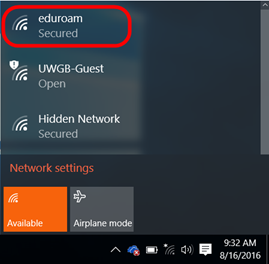 If your home institution is eduroam-enabled, you may use the more secure eduroam network as well. Click once and then click on "Connect" (or double-click). You will be prompted for your UWGB username and password. (Scholars using eduroam can use their home account information.) NOTE: Be certain to use the full email address as shown below. 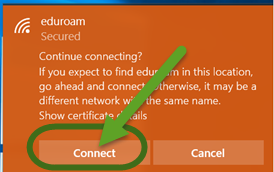 Select "Connect" at the Windows Security Alert. You will now be connected to the eduroam network.